Poinsettias make great gifts and add holiday decor to any residence or business. It seems that every year growers present a new color to go along with the more traditional red, white,and pink. We've even seen candy-striped, green, purple, and yellow poinsettias. Poinsettias should be watered regularly. Be careful not to over-water them, just wait until the top of the soil feels dry to the touch. If you want to grow your poinsettia in the garden after the holiday season, make sure to keep it healthy while indoors by placing the plant in a sunny, draft free location. Look for metallic, shiny foil in bright red, green, gold, silver, and white. Or you can spend a little extra on embossed foil to wrap the pot. After covering the pot, wrap them in seasonal colored ribbon, such as plaid or red velvet and top it off by adding a lush bow. A bit of glitz and glamour will delight your friends and family. Experiment with curly ribbon for a firework burst of color that you can drape over the pot's rim. For a more glitzy look, spray a few ribbon curls lightly with glitter. You might even spray some glitter on the bows. If you are gifting the poinsettia, be sure to choose wraps and foils that fit in with almost any decor and would be suitable for friends, family and business clients. Instead of wrapping the pot with foil you can decorate it with a garland. The garland should cost less than a dollar, but will make the pot look fancy and festive. Choose a tinsel garland or use a beaded, jeweled, or permanent flower garland. Spray adhesive to the outside of the regular poinsettia container and then wrap strings of the garland around the pot. Voila! Poinsettias are lovely and speak of holidays all on their own or dressed up to the nines! 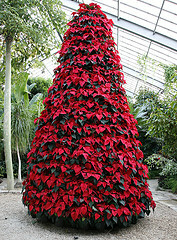 Look at this festive Christmas tree below, it is made from lots and lots of poinsettias! Probably too dramatic and not practical for a residence as is, but imagine how amazing it would look in a scaled down version! No, they are not poisonous. Urban legend is responsible for that toxicity myth, which 50% of Americans still believe today. The Society of American Florists joined with researchers at Ohio State University to test various parts of the poinsettia plant and proved the poinsettia to be non-toxic to both humans and pets. According to POISINDEX, the national information center for poison control centers, a child would have to ingest 500-600 leaves in order to exceed the experimental doses that found no toxicity. As with any non-food product, however, the poinsettia is not meant to be eaten and can cause varying degrees of discomfort; therefore, the plant should be kept out of the reach of young children and curious pets. Holidays and glitter go together like Christmas trees and tinsel. A light spray of gold or red glitter on red poinsettia leaves can elevate them and garner twice as much attention. Don't go overboard with glitter, but do add some to leaves and bracts. What are bracts, you ask? The "flowers" are actually colored "leaves" called bracts, and not really flowers. Can I plant my indoor poinsettia in the garden? Yes, if where you live has a minimum temperature of about 45°. When the leaves fall in late winter, cut the stems back to the two healthiest buds and reduce watering to the bare minimum. Choose a well-draining location in your garden that gets full or partial sun, preferably against a southern exposure wall to protect them from strong winds. In areas where the temperatures drop below 45 it is best to keep them in a sunken pot that can be brought into the house as they can only tolerate a very light frost. Poinsettias grown outdoors will often reach 8-10 feet tall, so about every 2 months regular pruning is a must. Pinching the tips of new growth will produce a much bushier plant with many more, but much smaller flower bracts. Thinning the branches out without pinching the new growth will produce much larger flower bracts.